A thick and massive cloud of Saharan Desert dust filled the skies over most of Egypt and eastern Libya on January 22, 2004. 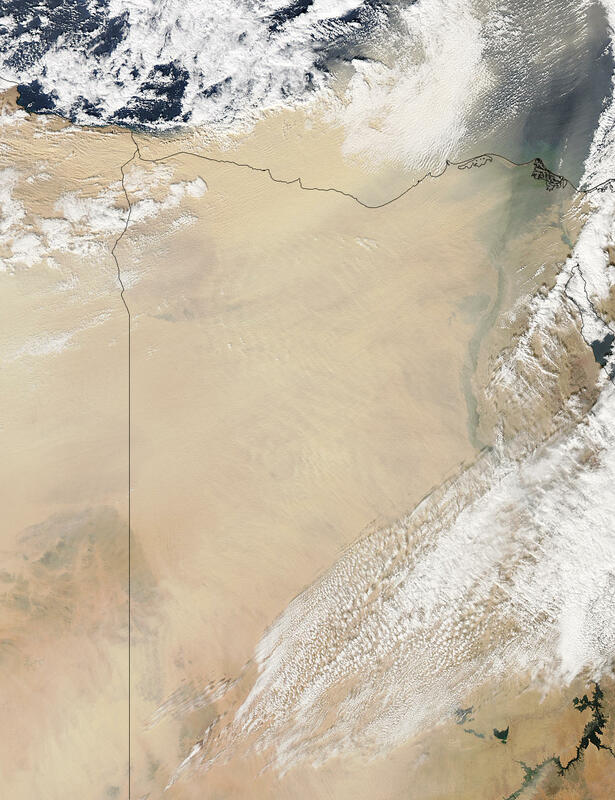 Roughly the size of the U.S. state of Texas, the tan-colored blanket of dust almost completely obscures the view of the surface in this true-color image of the area, acquired by the Moderate Resolution Imaging Spectroradiometer (MODIS) aboard NASA’s Aqua satellite. Blowing northeastward over the southeastern Mediterranean, toward Israel and Lebanon, the dust is so thick in some places it gives the appearance of a solid land mass extending out into the water when seen from above. The bright white patches in this scene are clouds, which are higher in elevation than the dust.